Update 08/31/2018 12:07: Just in time for the Labour Day long weekend, Apple has dropped an iOS 12 update that solves the frustrating, never-ending “please update from the iOS 12 beta” notification problem. To be clear, this issue only affects phones running the iOS 12 public beta 11. To Apple’s credit, the company has acted swiftly to solve this rather obnoxious problem after it first began appearing on August 30th. The update seems to be a downgrade to the iOS 12 public beta 10. That said, I can confirm that it does solve the pop-up issue having just installed it on my iPhone X. In order to download it, navigate to ‘Settings,’ then ‘General,’ and select, ‘Software Update.’ Finally, tap ‘Download and Install’ do download the iOS 12 Public beta 10. The original story about the glitch remains below. 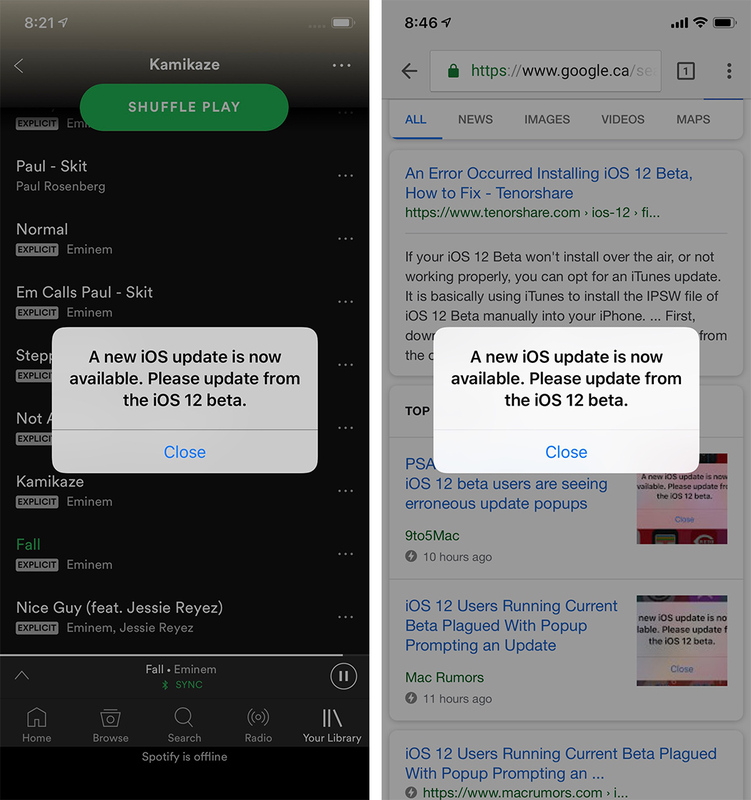 If you’re running iOS 12’s public beta and happened to have encountered what seems to be an erroneous popup asking you to “please update from the iOS 12 beta,” you aren’t alone. While a new update hasn’t dropped yet, there seems to be a bug in the latest iOS 12 public beta 11 that’s convinced the operating system that its expiration date has been reached, according to 9to5Mac’s Guilherme Rambo. Perhaps iOS 12 beta 12 is just around the corner or was originally supposed to be released yesterday. Regardless of the reason, this iOS 12 beta 11 pop-up is frustrating. It seems to occur randomly when the iPhone is unlocked. In some cases, it even pops up when launching an app. In my case, I receive the notification every time I unlock my iPhone X.
Hopefully, Apple releases a quick fix that solves the issue because as of right now there doesn’t seem to be a way to make the update pop-up disappear. What looks to be official renders of the iPhone XS, Apple’s next iPhone, along with images of the Apple Watch Series 4, recently leaked.